Teeth Whitening - What is it, How Does it Work, Cost, Dental Health Risks..
Home » Dental » What is Teeth Whitening and How Does it Work? What is Teeth Whitening and How Does it Work? With dental treatments becoming increasingly popular for cosmetic reasons, here we look at issues around teeth whitening, including what it is, how it works, the costs, benefits and any risks to health. Teeth whitening is the process of altering the colour of teeth through bleaching or other methods to achieve a desired whiter shade. It is most often done for cosmetic reasons, with many people viewing whiter teeth as healthier and more attractive. 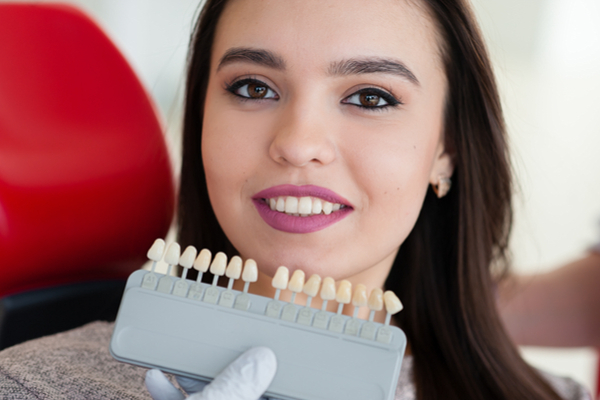 Natural tooth colour varies among individuals, and healthy teeth are often an off-white or bone colour, which may be several shades darker than the “Hollywood white” shade portrayed in much of the modern media. In addition, an individual’s teeth generally darken in colour over their lifetime, due to both environmental factors such as staining from tannins in food and drink, or smoking, and also from the natural darkening of the underlying dentine which happens gradually as you age. Teeth whitening treatments work to reverse or delay those changes, and can do so effectively, with the longevity of the results depending largely on your lifestyle and dental hygiene after a course of treatment is completed. The home of beautiful white teeth is, of course, the USA. In recent years, teeth whitening has grown to become the most commonly requested cosmetic dental procedure, with recent US studies estimating around a third of the population using one form of treatment or another, and spending a total of over $11 billion annually on tooth whitening treatments and products. In the UK, the figure is estimated at over 100,000 patients – and growing rapidly, with a third of adults reported to be considering teeth whitening. This includes a wide range of procedures, from DIY treatments to professional teeth whitening performed by a qualified dentist or hygienist. Most dental surgeries in the UK will offer teeth whitening treatments, usually comprising several visits to the dentist. The chemical process of teeth whitening works by using hydrogen peroxide to bleach the tooth to a light shade. This chemical usually comes in the form of a gel and may start as carbamide peroxide, which then breaks down into hydrogen peroxide – the active ingredient. How does it work at the dentist? In the most common version of the procedure, teeth whitening at the dentist works by first arranging an initial visit to create a cast of the patient’s teeth, from which a unique mouthguard is created. The dentist will then instruct the patient in using the mouthguard to apply a bleaching gel at home, usually at regular intervals for two to four weeks. The patient will usually return to the surgery during the bleaching period to assess the effectiveness of the treatment and check for any issues, with a follow-up appointment once the treatment is complete. The treatment works by bleaching both the surface enamel and also penetrating through to bleach the underlying dentine, thus changing the fundamental colour of the tooth. Some dentists offer laser tooth whitening, also known as power whitening, to accelerate the process, but the benefits of this are disputed by some studies. See some answers to common questions about teeth whitening treatments from Meneage Dental – BDA (British Dental Association) Good Practice members in Cornwall, UK. Teeth whitening is not usually available on the NHS, except in cases where there is a medical need, such as tooth discolouration due to nerve damage. It can, therefore, be a relatively expensive procedure, costing from £300 up to £1,000 for a single course of treatment. Once complete, the effects of the treatment can last for anything between a few months to a few years, depending on the individual patient. Genetic factors such as tooth composition as well as lifestyle factors such as smoking, drinking alcoholic or caffeinated beverages, and general dental hygiene will all have an effect on how well the treatment works and how long the effects last. While teeth whitening treatments have been seen to be offered at beauty salons, often at a lower cost than a dental surgery, this practice is now illegal under UK law. Teeth whitening may only be carried out professionally by a dentist or registered dental therapist or hygienist. Some salons have attempted to circumvent the law by allowing patients to administer their treatment themselves under a therapist’s supervision, although this is still illegal. Home teeth whitening kits are allowed under law. However, experts strongly recommend that patients undergo the procedure at a dental surgery. Common problems reported with home kits include poorly fitted mouthguards which allow the bleaching fluid to leak and irritate or damage gums, uneven results due to poorly designed or fitted equipment and increased sensitivity due to damage to the tooth enamel. Using these treatments without qualified supervision can also be dangerous for the minority of individuals for whom the procedure is not suitable. For example, those with gum disease, specific allergies, or dental implants, bridges or crowns. In addition, home whitening kits are legally limited in the amount of bleaching agent they can contain, being limited to a concentration of 0.1% hydrogen peroxide, as compared to concentrations of up to 6% in treatments used at dental surgeries. Other home treatments available over the counter such as whitening toothpaste, mouthwash, chewing gum and gel generally contain very little, if any, bleaching agent, and instead rely on abrasive substances to scrub stains from the enamel surface of the teeth. This is less effective than professional bleaching, as it does not alter the colour of the underlying dentine. Overuse of abrasive methods can also gradually wear away tooth enamel, causing weakening of the tooth, and also over time, greater transparency of the enamel, further revealing the darker enzyme and therefore leading to more, rather than less discolouration overall. There are a number of potential teeth whitening risks, some of which are temporary and associated with the process itself, while others are longer lasting or permanent. The most common complaints during a course of teeth whitening are irritation of the gums and increased sensitivity of the teeth themselves, which in most cases only persist during the treatment period. Irritation can be caused either by exposure to the bleaching chemicals or physically as a result of an ill-fitting mouth guard. Longer lasting or permanent problems include irreparable damage to the tooth enamel, which can heighten the risk of teeth breaking or succumbing to decay, as well as increased transparency as mentioned above. As the popularity of teeth whitening has increased, concerns have also grown about a small number of repeat patients developing an unhealthy obsession with frequent treatments, to the detriment of their health. A good dentist will, of course, put patient health before profit, and would not conduct repeat cosmetic dentistry treatments where there is no real benefit. The trend for seeking more beautiful, whiter teeth looks set to continue, and for the vast majority of patients, teeth whitening is a safe and painless cosmetic procedure that can make a real difference to their appearance. The research suggests though that the key to ensuring this comfort and safety is the use of properly regulated dental surgeries, and combining the teeth whitening treatments with good oral health practice at home to prolong the effects and reduce the need for repeat visits. The Health A to Z is a global Healthcare, Medical and Dental website showcasing the best companies, tips and technologies. We'll signpost great blogs, websites and social media channels and aim to make it the best possible resource for this sector!